It looks like commodities, measured by the CRB are descending into multi-year lows. If I’m correct about oil, we should see a significant bottom in the first quarter (Q1) of 2019. Precious metals typically bottom before oil and the CRB. 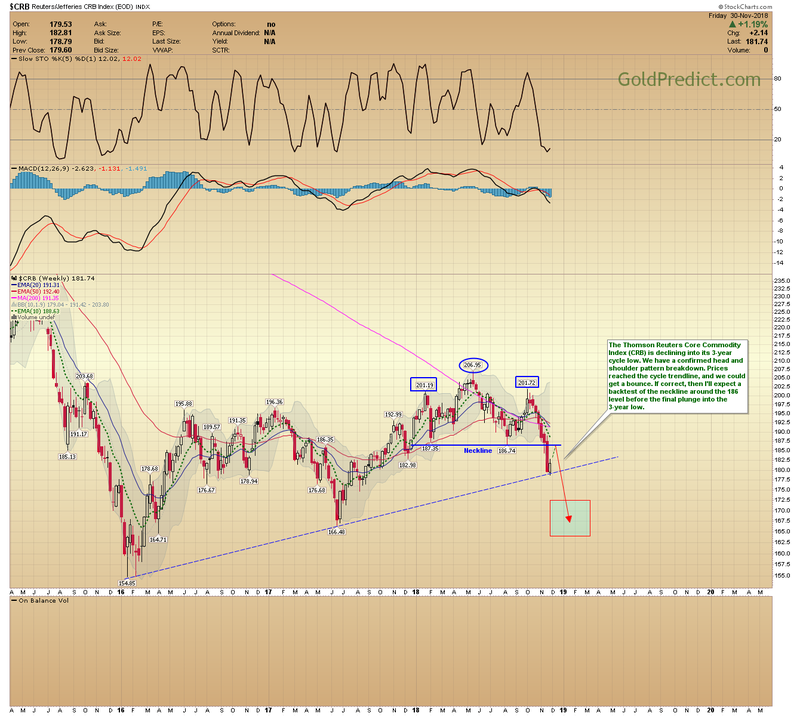 I think gold will bottom in December – January at the latest. The indecision and lack of follow-through in miners is consistent with a bottoming process. Prices could be following a similar process to what appeared in late 2015 early 2016. I think we are approaching very tradable lows. 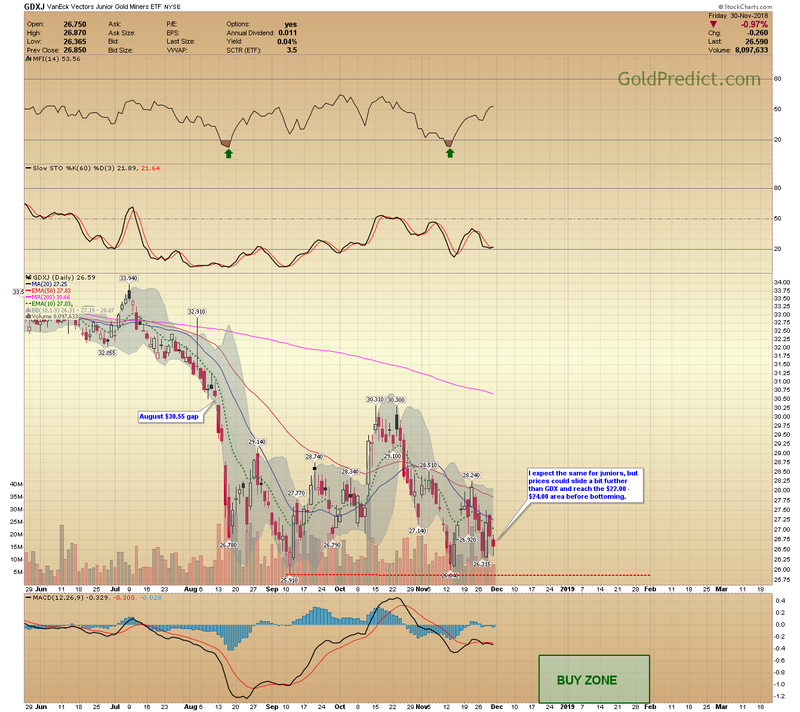 Timing the bottom in gold could be a bit tricky. 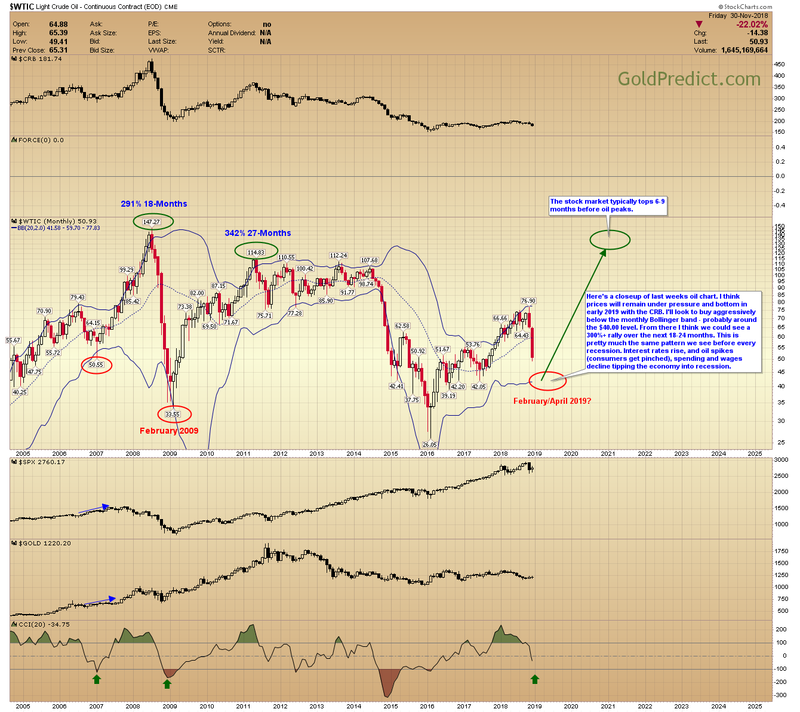 Generally, gold bottoms within 1-2 days of the December Fed meeting (December 19th). However, the current 30-day cycle supports a low several days later – between the 27th and 31st of December. We should be able to narrow down the proper timing model as Fed-day nears. 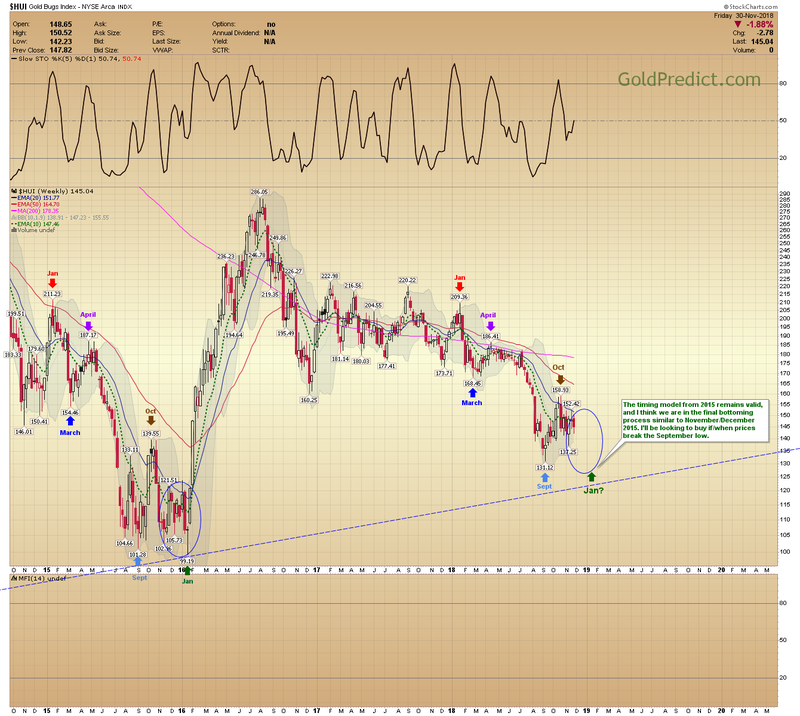 -GOLD WEEKLY- I’ve been calling for an October top, November decline, and December bottom. The November period proved ineffective and failed to break the cycle trendline (blue). Now prices need to break lower in December. I think we will at least see a retest of the $1167 level before the next bottom. The current structure favors a smaller version of the late 2015 pattern. 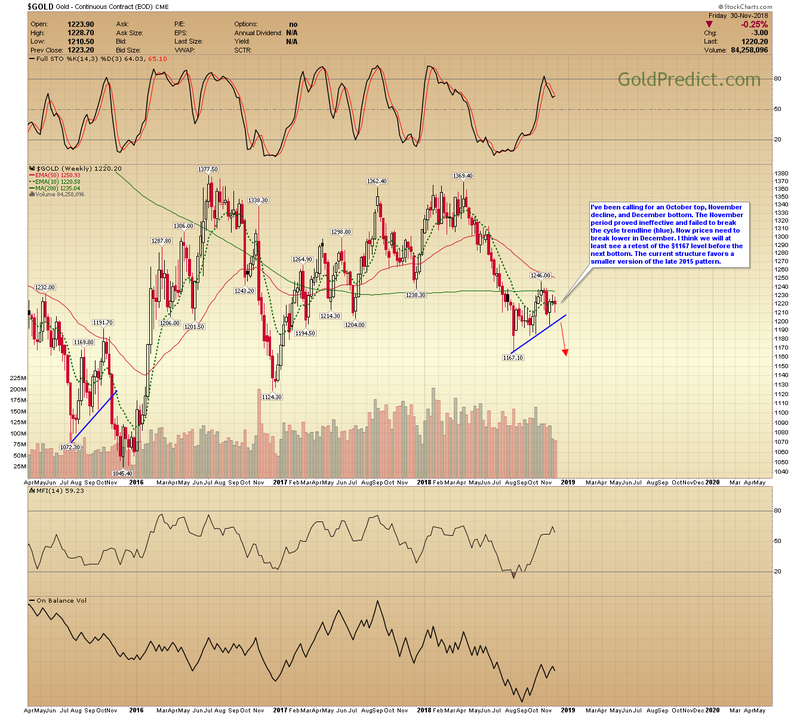 -GOLD DAILY- Gold typically bottoms very close to the December Fed meeting. This year that event arrives December 19th. The 30-day cycle suggests the next turning point (probably a low) should land between December 27th – 31st. There’s a small conflict between these timing measures, and it’s unclear how it will be resolved. 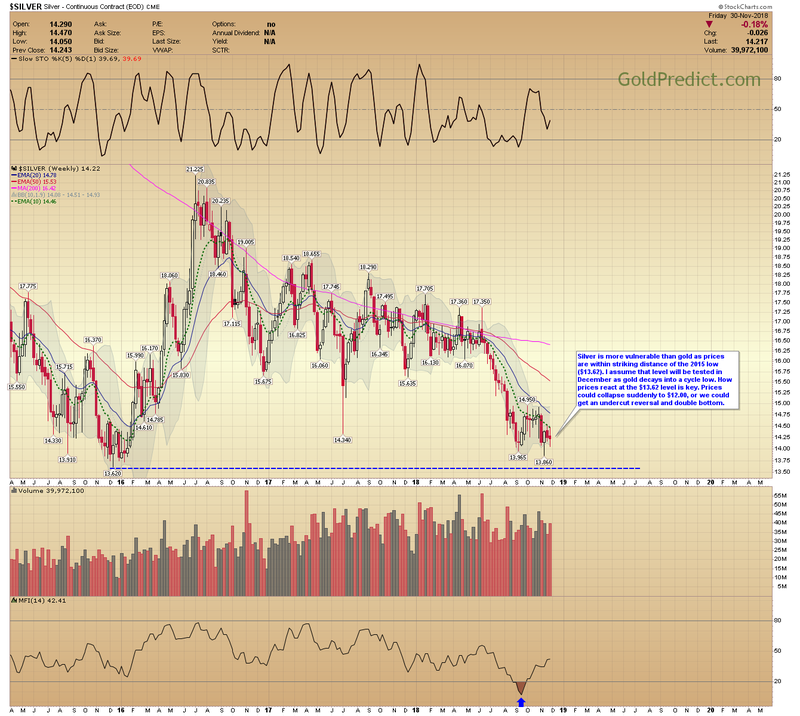 -US DOLLAR- The dollar is due for a cycle correction, and momentum is fading. 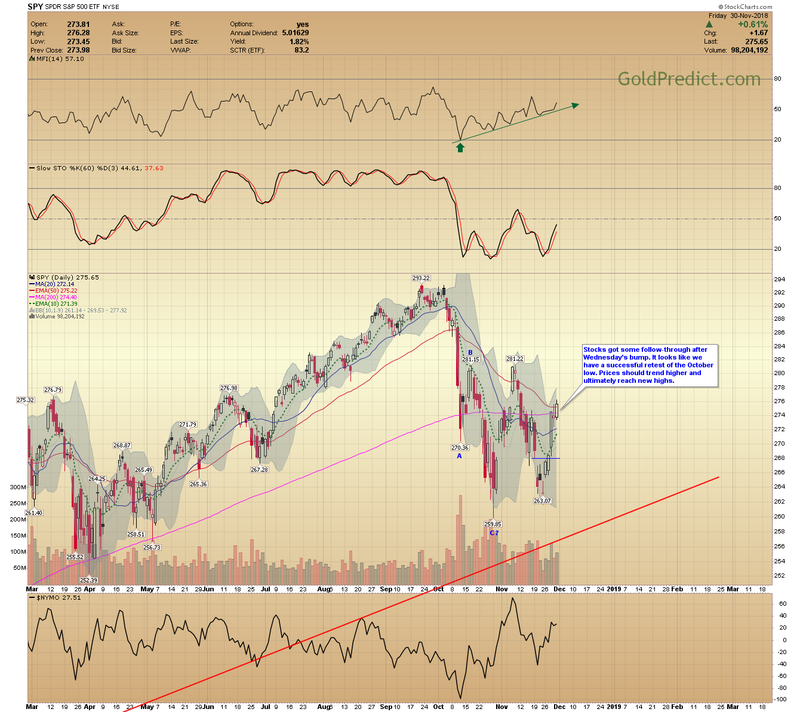 However, prices refuse to break the cycle trendline. The December 19th Fed meeting will likely time the next turning point. At the moment it’s unclear if it will mark a high or a low. If it’s going to be a low…then the dollar needs to get serious and break the cycle trendline soon. -SILVER WEEKLY- Silver is more vulnerable than gold as prices are within striking distance of the 2015 low ($13.62). 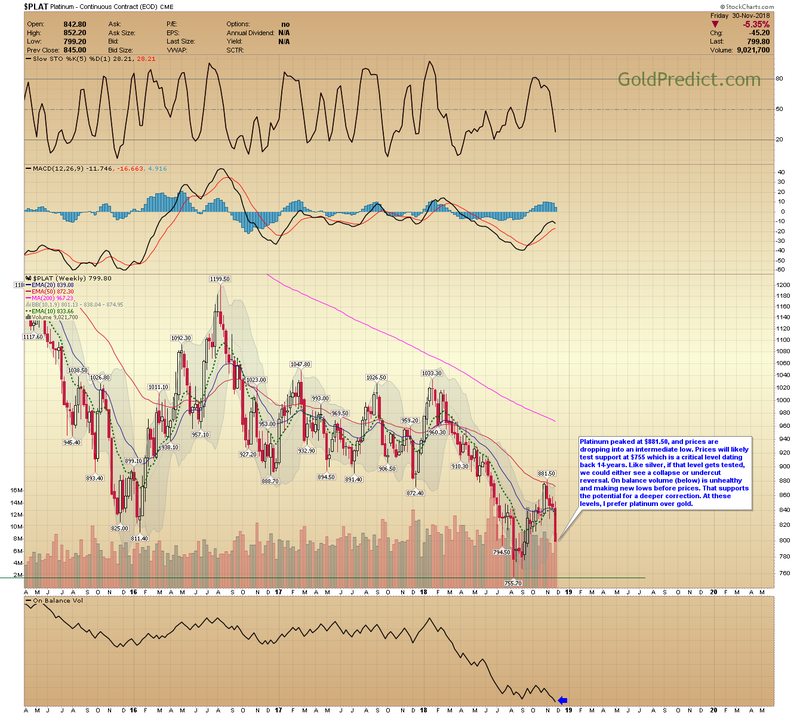 I assume that level will be tested in December as gold decays into a cycle low. How prices react at the $13.62 level is key. 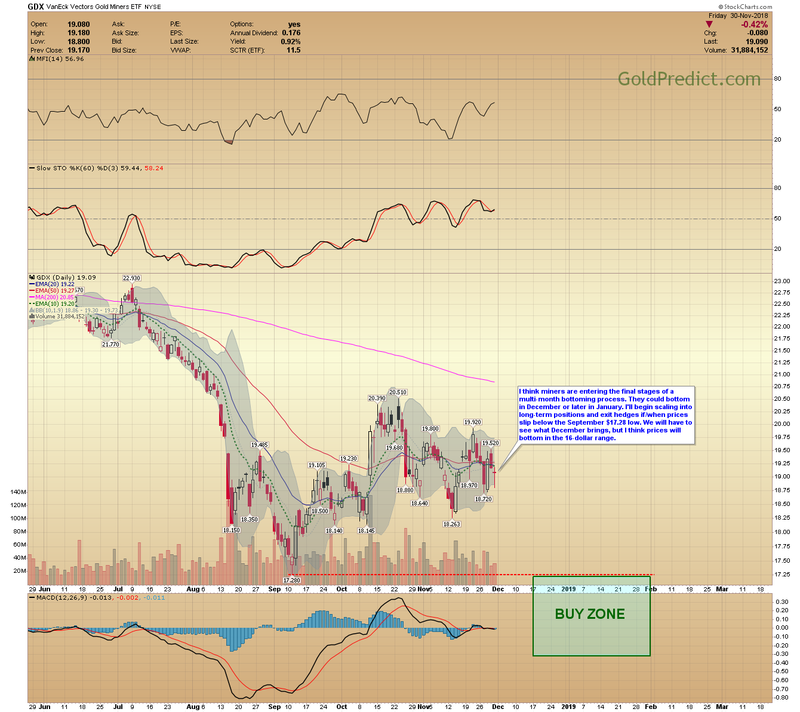 Prices could collapse suddenly to $12.00, or we could get an undercut reversal and double bottom. -PALLADIUM- Palladium is the best performing precious metal – reaching new highs last week while gold tarries well below its 2011 peak. -PLATINUM- Platinum peaked at $881.50, and prices are dropping into an intermediate low. Prices will likely test support at $755 which is a critical level dating back 14-years. Like silver, if that level gets tested, we could either see a collapse or undercut reversal. On balance volume (below) is unhealthy and making new lows before prices. That supports the potential for a deeper correction. At these levels, I prefer platinum over gold. -HUI MINING WEEKLY- The timing model from 2015 remains valid, and I think we are in the final bottoming process similar to November/December 2015. I’ll be looking to buy if/when prices break the September low. -GDX- I think miners are entering the final stages of a multi-month bottoming process. They could bottom in December or later in January. I’ll begin scaling into long-term positions and exit hedges if/when prices slip below the September $17.28 low. We will have to see what December brings, but I think prices will bottom in the 16-dollar range. -GDXJ- I expect the same for juniors, but prices could slide a bit further than GDX and reach the $22.00 – $24.00 area before bottoming. -SPY- Stocks got some follow-through after Wednesday’s bump. It looks like we have a successful retest of the October low. Prices should trend higher and ultimately reach new highs. 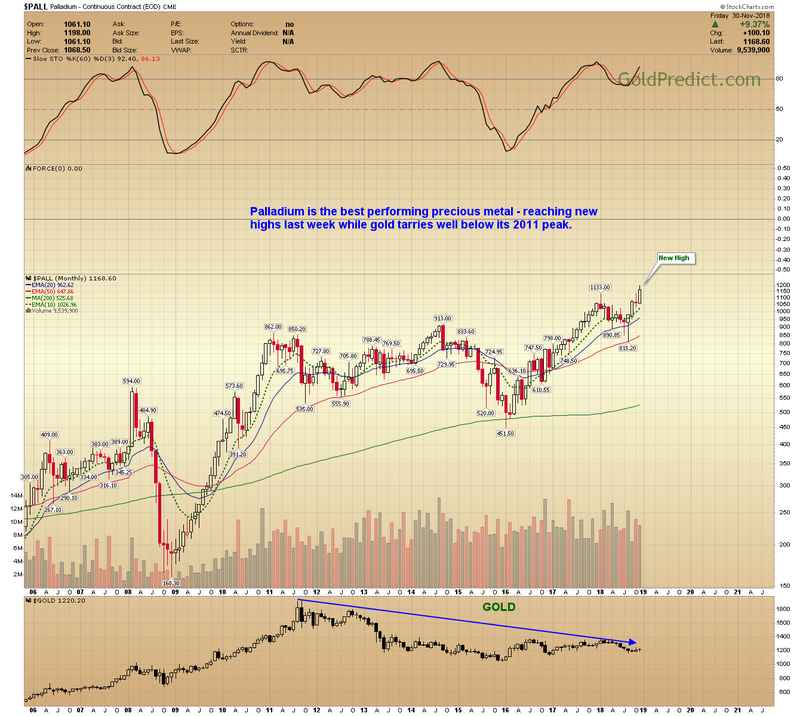 -WTIC MONTHLY- Here’s a closeup of last weeks oil chart. I think prices will remain under pressure and bottom in early 2019 with the CRB. 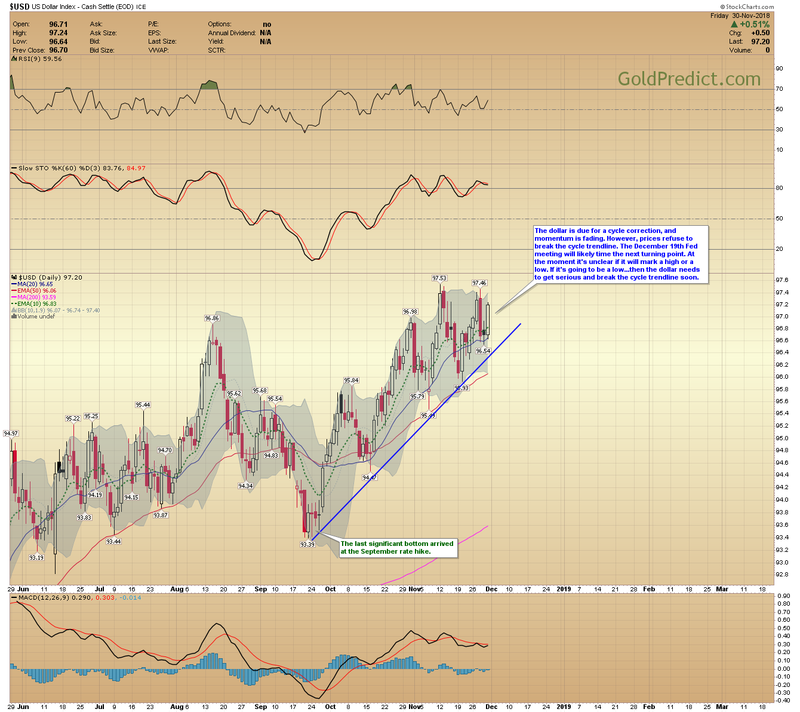 I’ll look to buy aggressively below the monthly Bollinger band – probably around the $40.00 level. From there I think we could see a 300%+ rally over the next 18-24 months. This is pretty much the same pattern we see before every recession. Interest rates rise, and oil spikes (consumers get pinched), spending and wages decline tipping the economy into recession. 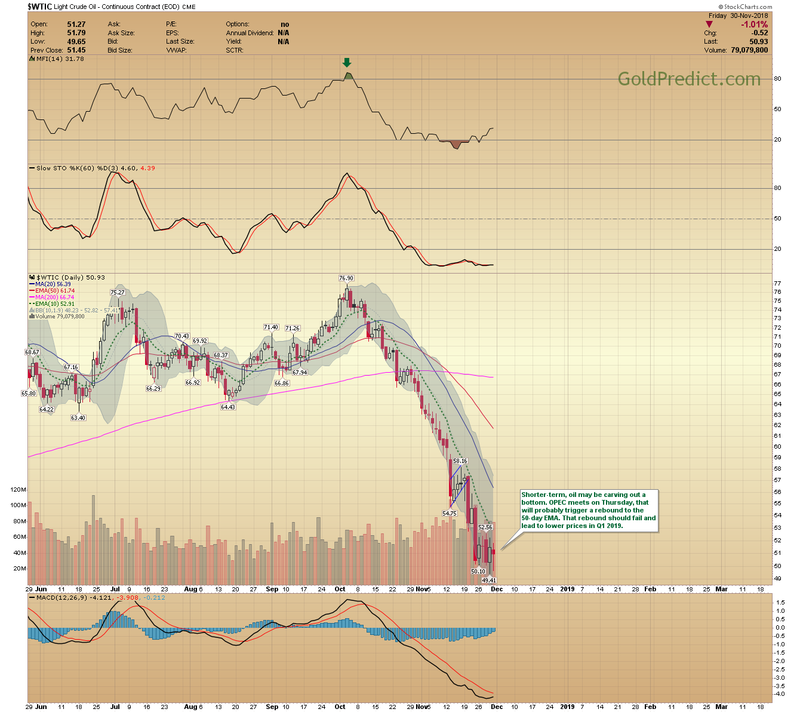 -WTIC DAILY- Shorter-term, oil may be carving out a bottom. OPEC meets on Thursday, that will probably trigger a rebound to the 50-day EMA. That bounce should fail and lead to lower prices in Q1 2019. -CRB WEEKLY- The Thomson Reuters Core Commodity Index (CRB) is declining into its 3-year cycle low. We have a confirmed head and shoulder pattern breakdown. 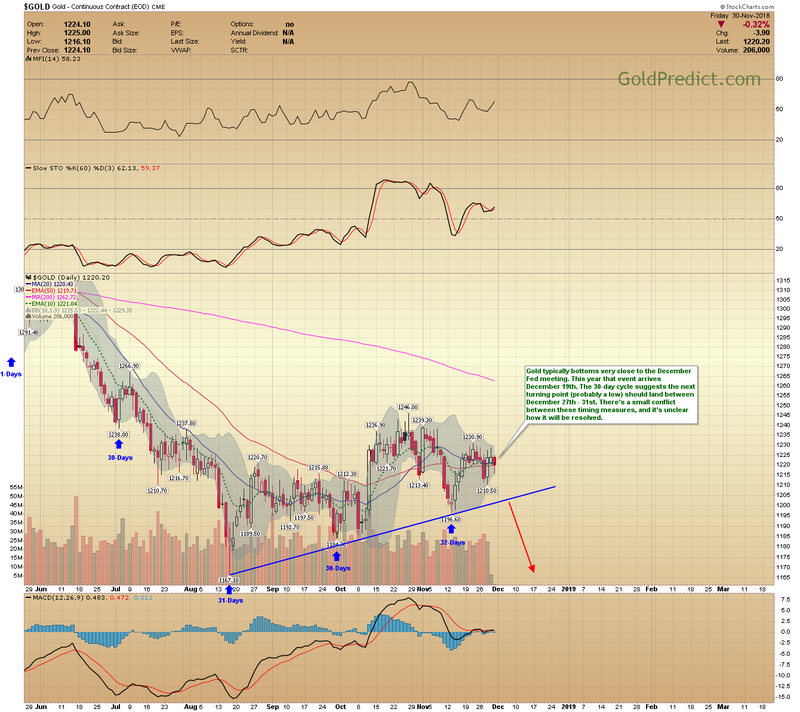 Prices reached the cycle trendline, and we could get a bounce. If correct, then I’ll expect a backtest of the neckline around the 186 level before the final plunge into the 3-year low. I think we are approaching some excellent trading opportunities. Next year and 2020 should make up for the dismal 2018.